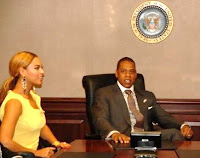 Jay-Z and Beyonce visited the White House on Wednesday before his concert later that night. They received a tour that included a stop in The Situation Room. No. Not Mike "The Situation's" room of "Jersey Shore." They met briefly with President Obama. Don't forget that Beyonce serenaded the First Couple during the Inauguration last year. 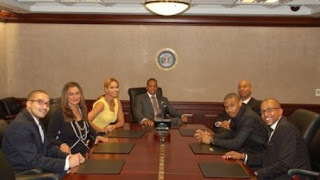 That's Jay-Z and Beyonce's posse with them in The Situation Room. Jay-Z's concert got generally good reviews. So did his stop at the White House. What? No pictures with the president? Maybe they didn't want a picture that would live forever: remember Elvis with Nixon? I'm willing to bet there are pictures and they will be release one day. Like that yellow dress B. Nice suit J. Don't forget to call me next time.